Good oral hygiene is something we really stress with our kids. After breakfast and before bed the four of them line up in the bathroom and each take a turn brushing their teeth. Even the 18 month old climbs up on the step stool so I can brush his teeth for him. However one thing I do not do regularly is floss. I tried with my oldest a few times using individual flossing "sticks" but he complained that it hurt so I stopped. 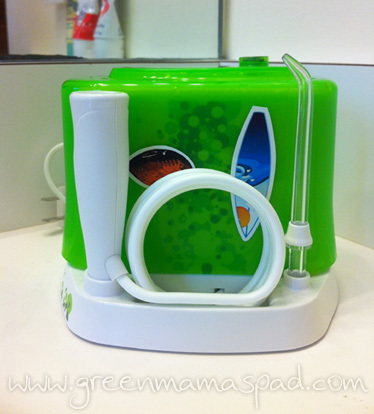 Recently Waterpik came out with a new Water Flosser For Kids and I knew this was something we needed to try out. 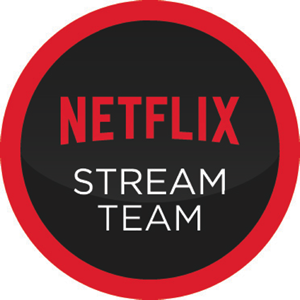 I thought it would be the perfect alternative for us. 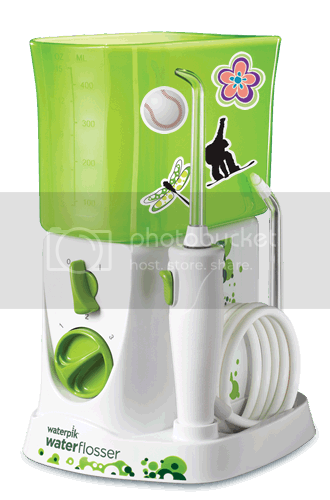 The Waterpik® Water Flosser For Kids WP-260 is the easier, more effective, and more fun alternative to string floss for kids. The Water Flosser For Kids is a customized model for children ages 6+, with a small and simple design that makes water flossing easy. It's perfect for any kid that has braces or has trouble flossing. Waterpik® Water Flossers are the only brand clinically proven to be an effective alternative to traditional floss for removing plaque biofilm and reducing gum bleeding and inflammation. In conjucntion with brushing, Water Flossers have been proven 3X as effective than string floss, and 5X as effective as brushing alone, for cleaning around braces. 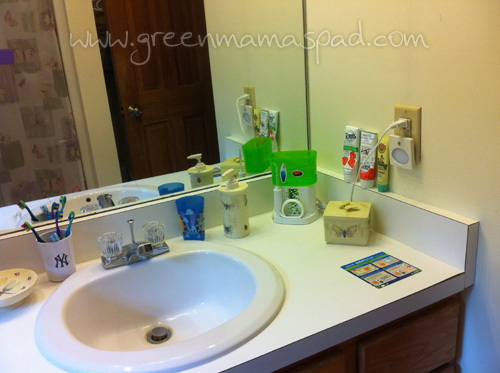 A fun feature for the kids is that they get two sheets of clings that they can use to decorate their Water Flosser. This was the first thing my son did. Since they are clings and not actual stickers, you can move them around or switch them out over and over again. For right now he picked a football and . In the future when the other boys are old enough to use I figure they will each get to pick one or two clings to put on. Now I will say that this Water Flosser has a learning curve, especially when dealing with young children. Overall it is very easy to use: fill the tub with warm water, set pressure (I recommend low to start with), put pik in mouth and turn on. For some reason my son and I kept getting water EVERYWHERE. It was actually slightly comical. The key is to have your child keep their mouth closed and if they need to take it out, TURN IT OFF FIRST. I can't tell you how many times we forgot that part. The first night we used it he had to change his pajamas they were so wet. But after a few tries you start to get the hang of it. They include a waterproof guide that I keep on the counter to remind myself of the steps. Here is a quick video from WaterPik on how to use it. When you are all done with your flosser, you can turn the tub upside down and slide it over the unit to keep it clean and for even more compact storage. I also suggest unplugging it when it is not in use. I don't know for sure if it uses any energy when it is turned off, but I left it plugged in overnight and the next day the base was warm so that tells me that it does. No need to be adding extra cents to your electric bill so unplug it and wrap up the cord! If your child has braces this Water Flosser also comes with an orthodontic tip. This was also important to me because I have already been told by our pediatric dentist that the 3 older boys all have slight overbites and there is a chance that ALL of them will need braces when they are older. No word on the little guy yet but since his brothers have it, he probably will too. The though of paying for four sets of braces scares me! At least I have a great tool that will help then clean in between their braces should they actually end up getting them. My plan is to buy some additional tips so they each have one of their own. The only wish I have for the Water Flosser For Kids is that it would be nice if it had more slots to hold additional tips for families with more than one child. 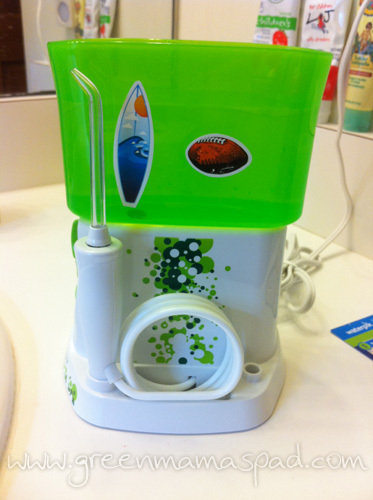 The WaterPik Water Flosser For Kids retails for $49.99 and is available for purchase at select retailers like Target, Wal-Mart, Rite Aid and Meijer. It may also be purchased online on Target.com. Click the image below to download and printout a $5.00 coupon to use at your retailer. In-store purchase only, expire 12/31/2011. Please note that the opinions and views expressed in this review are my own and based on my personal experience with the product and/or company. You may encounter a different experience with this than I did. I received a product free of charge for review. This post may contain affiliate links. I did not know they even made these. How cool. I might have to get one for my kids. Thanks for the great review. Neat! I should get one for my son. He has an odd fascination with mouth washing implements. He hates brushing his teeth, but the child will use three different flavors of mouth wash in one day. I think he'd love the idea of using a tiny hose to clean his gums. LOL. I can picture the water squirting everywhere, lol!!! What a great idea to make one designed for kids! It looks really great! I believe my son would love this. What would a Orthodontist say?